It's been a long time since I've posted fresh flowers of the week! Honestly, it's because I haven't had fresh flowers in awhile. I have a Christmas tree so that's good enough for now, plus the selection at the supermarket hasn't been so great. Here are the flowers that just arrived at my door. Since boyfriend took a new job we haven't been able to spend much time together. Oh the joys of I.banking. 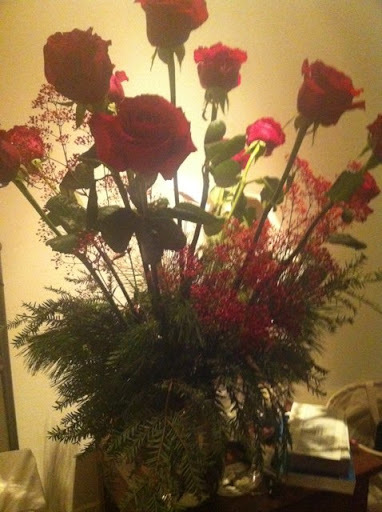 These roses with evergreens and glittery red baby's breath start to make up for that all. They smell like Christmas!